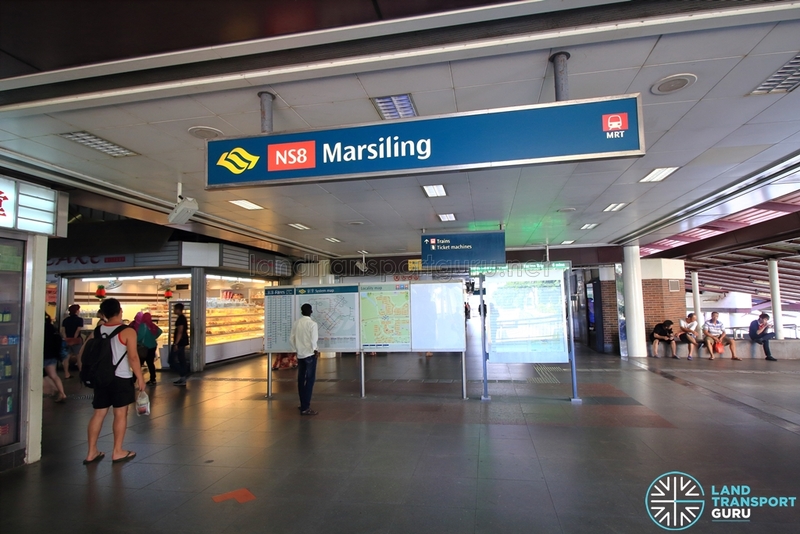 Marsiling MRT Station (NS8) is an above-ground station along the North South Line (NSL). 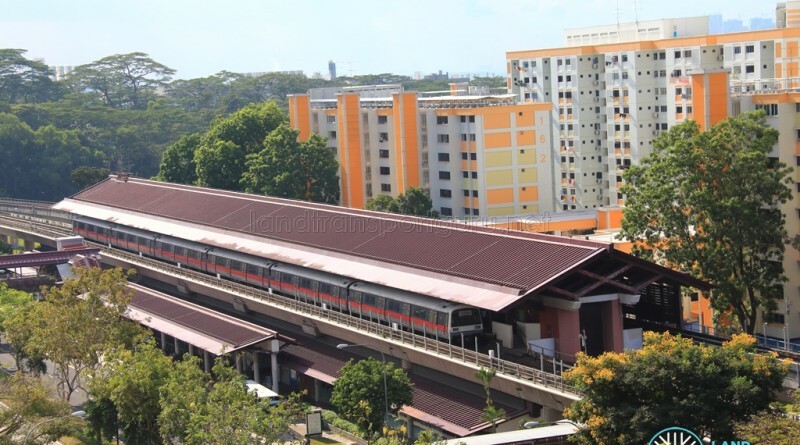 It is located within the Woodlands West planning subzone, (near the border of the Woodgrove subzone), and located next to Woodlands Avenue 3, near the junction of Woodlands Centre Road / Woodlands Avenue 1 and Woodlands Street 11. 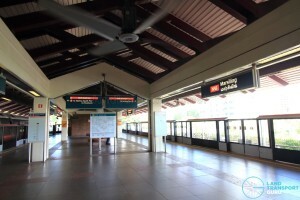 Named after the nearby housing estate to the north, Marsiling station was opened in February 1996 a part of the NSL (Woodlands Extension), and is one of three stations serving the Woodlands New Town (alongside Woodlands and Admiralty stations). It serves residential areas around the Woodlands West areas (Neighbourhoods 1, 3 and 4), along with schools and community amenities. 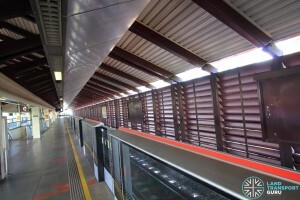 Marsiling station has two elevated North South Line platforms in an island platform arrangement. Half-height Platform screen doors are installed at the platform edge for commuters’ safety, and High Volume, Low Speed (HVLS) fans keep passengers cool. 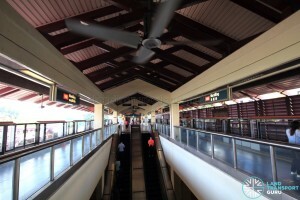 Similar in design to many other North-South Line elevated stations, a double pitched roof shelters the platform level, supported by two rows of columns. A set of escalators, stairs and lifts connect to the concourse level below. 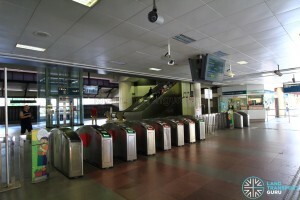 Toilets and retail shops are located in the unpaid areas of the station, at ground level. Marsiling MRT station has four exits at ground level (A, B, C and D), all of which (except Exit D) offer barrier-free accessibility for the disabled. 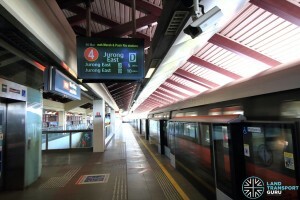 Marsiling station connects to several bus stops in the vicinity, as well as a taxi stand and passenger pick-up point, and a designated Park & Ride carpark. 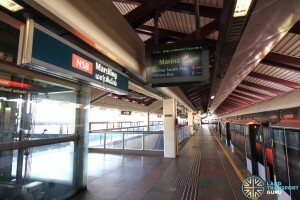 There are two official bus stops linked to Marsiling station. 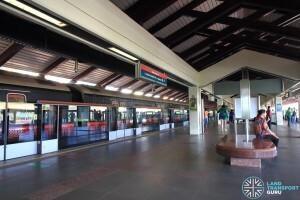 In addition, passengers can board regular bus services at bus stops officially linked to Marsiling station depending on the situation on the ground. Located within the Woodlands estate, Marsiling station benefits community amenities and residential developments in the vicinity. 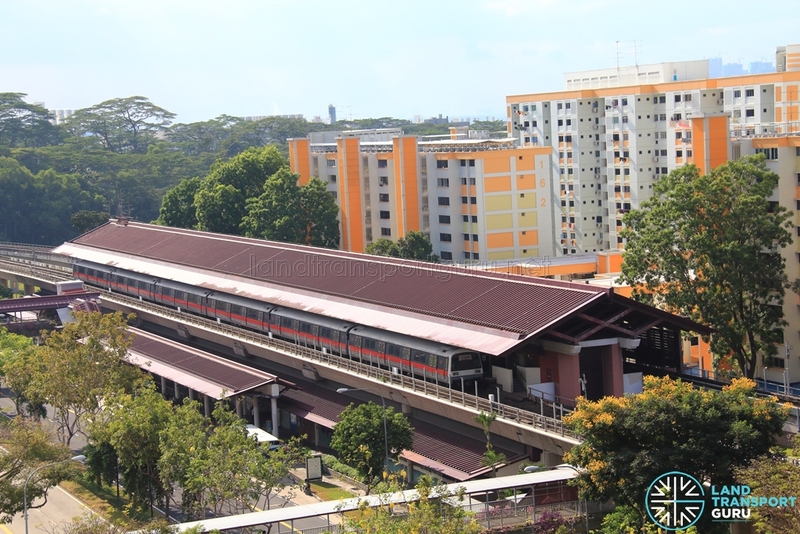 It is also a key transport node for Woodlands West residents, encountering moderate demand throughout the day. Hi can I stop and pick up passengers at marsiling MRT station taxi stand.cos that area got CCTV without getting summon for pick up passenger. Hi, motorbike can drop off or pick up at Marsiling Mrt? Not at bus stop it’s just next to mail box at marsiling mrt. Hi, above article indicates that there is a taxi stand, pick-up/drop-off point at the Woodlands Ave 3 road for Marsiling MRT Stn. Please enlighten me whether the taxi stand can be used as pick-up/drop-off point or do the Marsiling MRT Stn has another designated pick-up/drop-off point. 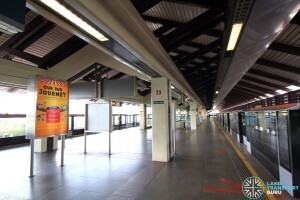 The taxi stand at Marsiling MRT Station along Woodlands Ave 3 (Eastbound) also acts as a passenger drop off / pick up point as per SMRT’s map at http://journey.smrt.com.sg/journey/station_info/marsiling/. However, there is a sign there stating no waiting / no parking except taxis.